This was by far one of the most highly anticipated sessions of BLF, and rightly so. It was full house before it started, and by the time it began in full swing, there were cheers and applause searing the atmosphere. This is not surprising at all, because the panelist of this particular session, was “the man who wears his business and creative hats with equal grace,” Piyush Pandey, in conversation with moderator Ganga Ganapathi. When asked about the ‘Pandeymonium’ (the title of his recent book on advertising) in the ad world, Piyush Pandey replied beautifully, “I love and thrive in chaos. I have never followed process in my life.” This was proven when despite the minor technical glitches during the session, he took it in a light manner and carried on with the show nevertheless. His session had one major thread running through it – the concept of influences. On where it begins, he said, “All of us have a creative instinct in us and all of us have the same experiences.” Later, he also said that “instinct has to be backed with some observations, and observations have to be shared, otherwise we become egoists.” And when he discussed the idea of taking inspiration from life, his take was, “A lot happens around you. So many experiences, so many things to see. 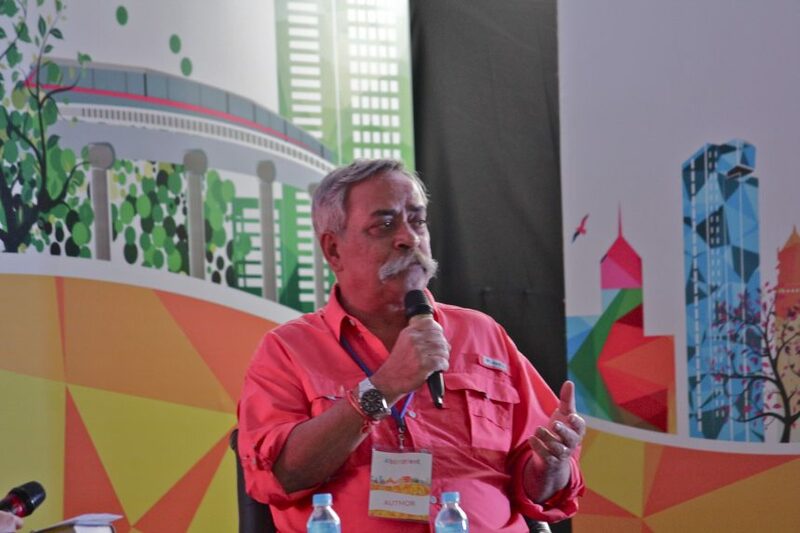 I think ideas are floating around us while we look for them somewhere else.” The special thing about this session was that Piyush Pandey showed several ads to the audience, thus elevating the greatness of this particular discussion. One of the brands Pandey has been recognised the most for is Fevicol. He explained famous Feviqwik ad is all about the time in the 70s and 80s when the movies were all about the underdog, and even with high-quality equipment, the gangster lost to the man with jugaadu abilities. Pandey also spoke about the current major topic, saying that personally, he believes that as a society, we have become very intolerant.